WEYV Announces Agreement with Highlights for Children, Inc., Enhancing In-App Content to Include More Than 250 Children’s Magazines and E-books | Altair Engineering Inc. 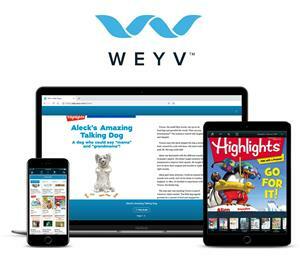 TROY, Mich., Jan. 15, 2019 (GLOBE NEWSWIRE) -- WEYV, an app platform with music, magazines, e-books and (soon) podcasts all in one app experience, today announced it will offer content from Highlights, the leading family media brand and publisher of the most-read children’s magazine in North America. Highlights is a beloved global media brand dedicated to helping children become curious, creative, caring and confident™ through engaging content and experiences that are focused on nurturing and developing the whole child. Through stories, poems, puzzles, jokes/riddles, science experiments, art activities, and more, kids are encouraged to think, problem solve, and build their literacy skills, all while having fun. Highlights reaches children 0–12 with their most popular magazines (Highlights Hello™, Highlights High Five™, Highlights High Five Bilingüe™ [English/Spanish], and Highlights®), digital apps, toys/games, and books incorporating classic favorites like Hidden Pictures® puzzles, Goofus and Gallant®, Dear Highlights letters, and more. Because Highlights offerings may be print or digital, purchased through subscriptions or retail, kids can engage with Highlights anytime, anywhere. To learn more and connect with Highlights, visit Highlights.com, HighlightsKids.com, Facebook.com/HighlightsForChildren, Twitter.com/Highlights, Pinterest.com/FunWithAPurpose, and Instagram.com/HighlightsForChildren.